Model SC450G is iIntended for the low conductivity applications found in the semi-conductor, power, water and pharmaceutical industries. These analyzers work with contacting conductivity sensors. The ISC450 is designed to measure Specific Conductivity by using the Inductive Conductivity method. This method is especially suitable for high conductivity measurements. The model SC450 is designed to measure specific conductivity with contacting electrodes. This method is proven to offer very high measurement accuracy especially in pure and ultra pure water applications. The SC450 a has self tuning pre-amplifier to eliminate the measuring errors that are associated with cabling or with polarization associated with high conductivities and cell fouling. The integrity of the signal across the electrodes is monitored continuously to activate a call for maintenance or a fail message in the rare occasion that cell fouling would cause erratic readings. The standard SC450 covers almost all Conductivity Applications including all special software functions in the standard analyzers to reduce the number of configurations. This results in less inventory and less training needs for users that have multiple Conductivity applications. Unique touch screen operation with menu structure in 5 languages. Frequency, read-pulse position and reference voltage are dynamically optimized. Minimum: 1 μS/cm (underrange 0.000 μSx C). Maximum: 200 mS/cm (overrange 2000 mS x C). Minimum: 5 Ω x cm (underrange 0 Ω/C). Maximum: 1 MΩ x cm (overrange 1000 MΩ/C). Two isolated outputs of 4 to 20 mA DC with common negative. Maximum load 600 Ω. Bi-directional HART digital communication, superimposed on mA 1 (4 to 20 mA) signal. Burn up (21.0 mA) or Burn down (3.6 mA) to signal failure accorded with NAMUR NE43. Automatic or manual, for temperature ranges. Reference temp. : programmable from 0 to 100°C or 30 to 210°F (default 25°C). According IEC 60746-3 NaCl tables (default). Two independent user programmable temperature coefficients, from 0 to 3.5 %/°C (°F) by adjustment or calibration. Matrix compensation: with conductivity function of concentration and temperature. Choice out of 13 preprogrammed matrixes. Graphical Quarter VGA (320 x 240 pixels) LCD with LED backlight and touchscreen. Four SPDT relay contacts with display indicators. Contact outputs configurable for hysteresis and delay time. Remote range switching to 10 times the programmed range. 85 to 265 V AC ±10 %, 47 to 63 Hz, maximum consumption 10 VA.
9.16 to 30 V DC ±15 %, maximum consumption 10 W.
The ISC450 is designed to measure Specific Conductivity by using the Inductive Conductivity method. This method is especially suitable for high conductivity measurements. The analyzer works with a sensor with two toroidal transformers built in. An AC current induces a voltage in the process sample that results in a current in the sample. The strength of this current is proportional to the conductivity of the sample following Ohm's law. 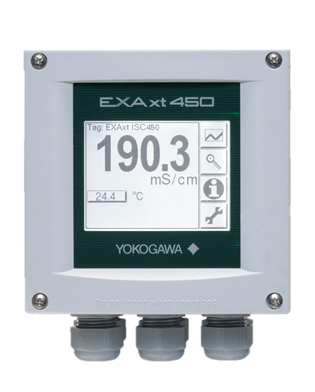 The EXAxt 450 series builds on the superior functionality of the industry leading Yokogawa EXA series by enhancing the EXA's proven operation and application flexibility. The ISC450 features a unique accuracy and rangeability, which is only possible through superior sensor design and electronic data processing using a self tuning preamplifier with more than 10 sub ranges with automatic zero adjustment at every range change. Accurate concentration measurement requires accurate temperature compensation and the ISC450 offers three compensation methods from default NaCl compensation to user defined MATRIX compensation for electrolytes where the coefficient varies with Temperature and with Concentration. 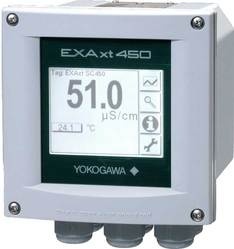 The EXAxt is highly intelligent and continuously checks the software, hardware and sensor system for irregularities. Not only will these irregularities be signaled through the main display as well as a signal output according Namur NE43, the transmitter will provide adequate instructions how to solve the errors. Unique touch screen operation with menu structure in 7 languages (English, French, German, Italian, Spanish, Portuguese, or Swedish). Compatible with ISC40 inductive conductivity sensor with integrated temperautre sensors: NTC30k or Pt1000. Two isolated output of 4 to 20 mA DC with common negative. Maximum load 600 Ω. Bi-directional HART digital communicaiton, superimposed on mA1 (4 to 20 mA) signal. Burn up (21.0 mA) or burn down (3.6 mA) to signal failure accorded to NAMUR NE43. Semi-automatic calibration using pre-configured OIML (KCl) standard tables, wiht automatic stabilit check. Manual adjustment to grab sample. Cast Aluminim housing with chemically resistance coating; Polycarbonate cover with Polycarbonate flexible window.